During the 41st U.S. president's one term, Soviet communism fell and Iraq's invasion of Kuwait was foiled. 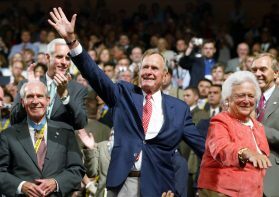 The "kinder, gentler" Bush was the last of a Washington breed that sought compromise. He put country over party. His successors reaped, and then squandered, the benefits. James Bond’s carmaker is eyeing a listing six years after an emergency pit stop. Rich margins and racy growth make it a close match for the prancing horse, justifying a $7bln valuation, and sixfold return for rescuer Andrea Bonomi. But Ferrari’s scarcity premium could be dented. Shell's $3.8 bln sale of North Sea fields to upstart Chrysaor gives a glimpse into the declining region's future. Lower prices make the remote province less appealing for energy majors but generous tax allowances offer private equity returns above 20 percent. The oil-rich sheikhdom is planning its first dollar debt sale. It should be a hit: Kuwait has a good fiscal record and vast foreign assets. Yet other Gulf states are weaker, raising the risk of devaluations or euro zone-style bailouts. The strongest may end up bearing the burden. A plan to follow Saudi Arabia by partially privatising its state-run oil industry could make sense for OPEC's fifth-largest producer. An IPO would generate needed billions for the government. Maximising proceeds, though, will mean ceding control of the crude still in the ground. The UK utility rightly snubbed a third approach at 5.3 bln stg after suitor LongRiver added a small sweetener. Its shares are pricing in a higher chance of deal failure. While LongRiver’s hardball tactics are risky, an agreement is possible. A compromise on dividends could help. For years bid talk has surrounded the UK’s last listed water utilities. Severn Trent is now in play. A bid could top $14 bln with debt, at 35 pct above the group’s regulated value. That would be rich. Regulation may get tighter. But debt is cheap and funds are eager for yield. The Swiss bank is fighting a claim that it failed to pay a Kuwaiti sheikh for advising on an $11 bln deal. Even if UBS suffers no lasting damage from the spat, it has exposed the extent to which big banks fall over themselves when schmoozing Gulf royals to win scarce business. It only takes a $20-a-barrel swing to move markets from fretting about the release of emergency reserves to worrying about top producers falling into fiscal deficits. Hard-to-cut higher spending by a growing number of big exporters may make the concerns permanent. The state of Kuwait wants to offload a 35 pct stake in its national carrier to a strategic partner. But the airline has been in the red for two decades, the asking price is lofty and bidders risk political pitfalls. Plans for a regional rail link don’t help the business case.